Upstate New York is not without it’s legendary love story. As a kid, I’d heard about Frenchman’s Island and the mystery surrounding it; however I didn’t know the details of the story until now. It is such an enchanting tale that I can’t ignore repeating it here! It’s a small, 56 acre island in the western section of Oneida Lake. Oneida Lake is New York’s largest inland lake, sitting in the center of the state. There’s a legend that goes back to the late 1700s. A Frenchman by the name of Desvatines supposedly fled his native country with his very young child bride. Reasons are not quite clear (this is why it’s a legend). Either they were aristocrats fleeing France’s Reign of Terror, or they left France to escape the wrath of the girl’s father. They made their way into the New York wilderness with only their stash of lovely French books and treasured silverware, settling on this tiny island in Oneida Lake. Together they cleared a small lot and built a cabin. Madame Desvatines nurtured a small and lovely garden of hyacinths and lady slippers. They planted apple trees, a large vegetable garden, and created a tiny Garden of Eden for themselves and their little family here. They entertained visitors, including a Judge Vanderkemp from Holland, new to New York. He described the French family’s gracious hospitality and enchanting settlement as a “paradise which happiness has chosen for her residence.” Of the Frenchman, he said, “Ragged as he appeared, without a coat or hat, but his manners were those of a gentleman; his address that of one who has seen the highest circles of civilized life.” Vanderkamp feasted on a meal of a fresh catfish, warm bread, salads, and vegetables from the garden, served on a delicate cloth with chinaware and silver. A year later, the island was sold out from underneath the Frenchman and his family. The Desvatines moved to a small town north of the lake, now known as Constantia. A European nobleman and friend from France, Duke Deroachefoucauld, had been searching for the family. He recorded that the Desvatines were a happy couple, raising their three children and “always laughing and complaining of nothing.” However the family had fallen on hard times; later they had to sell their collection of French books to Judge Vanderkemp. Before long, many more visitors from France were streaming in, but their financial situation did not recover. They disappeared from Constantia and were thought gone. But not long after their disappearance, reports were of a similar couple with the name “DeWardenou,” living on the eastern edge of Oneida Lake, near Wood Creek. They participated in the great salmon festival with the Indians there, driving the enormous fish down the creek to a trap for the Indians’ annual fish festival. Legend holds that one day a stranger came to a little town along the creek, speaking very little English. He discovered the couple in their poor little home. His heart was filled with such joy upon seeing them that it burst and he fell dead right then. It was Madame Desvatines’ father. He had come from France to tell her that all was forgiven. On his body was a discovered a will, turning over his vast estate in France to her. The family disappeared from records here. Some stories end with the tale that the couple traveled back to France, that they had tired of the wilderness which was starting to give way to more settlers looking for their little paradise here. Others end the story that the family moved once again, under the hospitality of a kind nobleman from the Hudson River valley area. We plunge through an immense forest where the path is hardly traceable. Delicious freshness that reigns there. Sight wonderful and impossible to describe. Astonishing vegetation. Enormous trees of all species. A disorder of grasses, plants, bushes. America in all her glory, waters running on every side, huge pines uprooted by the wind, twisted among plants of every sort. We embarked by ourselves in a little boat. With difficulty we reached the [Frenchman’s] island. Emotion we felt on setting foot there. Different look of the country we had just been through. Land gone wild again. Traces of man. We force our way through a belt of immense trees. We arrive at a clearing where trees, already big, had clearly once been cut. Some old, rotting trunks, leaning among brambles, plants and branches. In the middle of the island we find an old apple tree. Near there a vine, gone wild again, twining right up to the top of the neighboring trees like a liana. A house was there. There is no trace left of it. We wrote our names on a plane tree. We set out again. Profound silence of the island only broken by the birds that live there free. We traversed the whole island without finding any trace of the two beings who had made it their universe. This expedition is what has most vividly interested and moved me, not only since I have been in America, but since I have been traveling. Frenchman’s island was closed to the public for a long time, but is back open again. Of course, you need a boat to get there! There are no bathrooms, and no camping or fires are allowed. It is a completely wild area, with a few markers of civilization such as some old stonework, some trails, and a concrete lighthouse built in 1917. As a love of all things historical, let me say… that was a truly inspiring and wonderful story! Hi There! Love seeing the photos of places you visit. I like how you got the bird to pull your banner like that. Pretty cool! Never heard that Frenchman’s Island was haunted, and I wouldn’t believe it if I heard it. Just about EVERYTHING empty is claimed to be haunted…. who makes this stuff up?? Where can I launch my canoe to get to Frenchman’s Island? The best place to put in to get to Frenchman’s Island quickly is the Boats Afloat Marina or Oneida Shores Park – both on Lakeshore Road in Cicero/Bridgeport area. This puts you on Oneida Lake just south of Dunham’s (privately owned) and Frenchman’s Islands. For a more scenic ride, put your canoe in at Stones Kayak Club in Bridgeport and paddle up Chittenango Creek, which opens to Oneida Lake in Maple Bay. You can see the islands from the mouth of the creek. Enjoy! Lovely photos of Frenchmans Is. Paddled a kayak to it just last week. Took about 45 minutes of brisk paddling. I can’t tell you how beautiful and mysterious the feeling as I walked about the Island. I could imagine the Island’s first inhabitants, what they may have looked like, what form their dwellings might have taken. Its just a jewel of an island, and so nearby. I’m glad I can now legally visit it and enjoy the serenity. 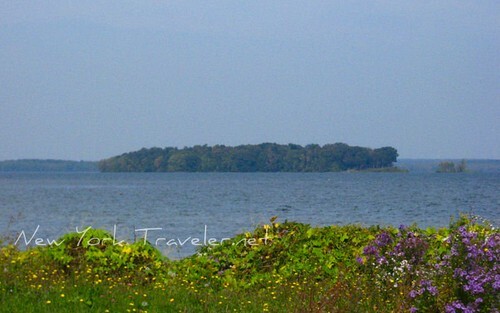 I would SO LOVE to visit Frenchman’s Island! Mrs M: Do you canoe or kayak? I would suggest that as the best means of seeing Frenchman Island. I have visited the island several times, by snowshoe and kayak, winter and spring. I find something awe-inspiring about it. Any further info about the lighthouse? If you and your family are paddlers, would you be interested in a group visit to Frenchman? I am available Tuesdays or Wednesdays. Madame Desvatines is also credited with giving birth to the first white child in the county! I took some nice photos of Frenchman’s Island and Oneida Lake this summer. To view go to Oneida_Lake_Paddles at Yahoo Groups. I live on Oneida Lake and I have been to Frenchman’s Island many times. Its a really neat place, there is a trail that leads from a state dock there to the light house on the north eastern edge of the island. Along the trail there is a huge crater, from what I am not sure. The state ended up putting up posted signs around the island though and I haven’t been back. I have heard rumors though that it is now a state park and open again to the public. 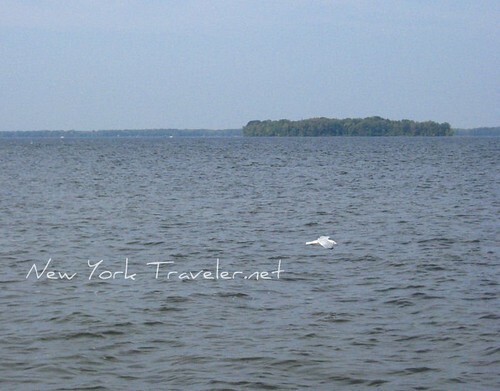 I now live on Oneida lake for the past year and have taken my family to Frenchmans Island several times, we find somthing new about it each time we go. There seems to be an old foundation in the far southeast corner of the Island, someone told us it was an old hotel do you have any info on this. It seems to be large enough for maybe a bed and breakfast. We also take a bag with us to pick up what some people leave behind. There use to be a gambling place years ago were my Grandfather worked when he was young. He told me about it years ago. I think it had to be before 1943 that was the year I was born. I wish I could give you more information. Linda — I did not know that! How interesting! I’ll have to do some digging and find out more. Didn’t get to kayak out to Frenchman’s this past summer. Really missed it. I did have an opportunity to speak with a member of the Fort Brewerton Historical Society. She was of the belief that the baby born to Monsieur & Madame Desvatine was buried on the island. If that’s the case, please tread the island with care and some degree of respect. In the late 1800s and early 1900s the island was a popular stop for locals. Steamboats made regular excursions to the island. That’s the reason for the dock that is still there. And I read somewhere that there was at least 1 hotel that was built upon it. Frenchman’s Island is an ‘undeveloped’ NYS park and open to the public. There are no amenities. No bathrooms, no camping. Enjoy and have a Merry Christmas. Just reading the book, Letters from America, by Alexis de Tocqueville. On pages 128-133, De Tocqueville is writing a letter to his sister about history of Oneida Lake and the Frenchman who brought his bride to America and settled there…interesting. It’s in german, but Sophie von La Roche wrote a book called Erscheinungen am See Oneida. The narrorator encounters this young couple and they tell their story and how they built their home and lived on the secluded island on the lake Oneida for four years. They had to swim over to the Indian colony when the lady, Emilie Des Wattines was pregnent and realized she couldn’t have the baby alone. The man’s name in the story is Carl Des Wattines. La Roche is from Germany and never travelled to the United States but got all her infromation for the novel from her son. He must have heard this legend or it must be true?